The Irish Civil War ripped apart the independence movement from 1922-23. This is an archive of our articles to date on the conflict. A good place to start is here – The Irish Civil War, an overview. The Anglo-Irish Treaty is signed, December 6, 1921. Mary MacSwiney and the Treaty Debates. The Dail votes for the Treaty, 7 January 1922. The ‘Bridges Job’ – a disastrous defeat for the IRA in Dublin on August 5-6 1922. Wellington Barracks – A Microcosm of the Irish Civil war – a look at the experiences of one barracks of pro-Treaty troops in Dublin during the war. British Military Involvement in the Irish Civil War. How British military aid and at times assistance all but decided the civil war. ‘A Damn good clean fight’ The Last Stand of the Leixlip Flying Column, an anti-Treaty column is trapped and wiped out in Kildare. The Tragedies of Ballyconnell – a series of raids and reprisal in the border area in 1923. March 1923 – The terror month, A month of grisly atrocities in Kerry. 10 April 1923, Liam Lynch is killed, by John Dorney. Harry Boland is killed, July 31, 1922. The shooting of Michael Collins, 22 August 1922. The Passing of the Public Safety Act – 27 September 1922 – legislation allowing for military courts and execution of republican prisoners. The Assassination of Sean Hales and reprisal executions, the killing of Sean Hales TD and the shooting in reprisal of four leading republicans. The Red Cow Murders revisited, October 7, 1922, by john Dorney. Who Shot Frank Lawlor? – an article about assassinations in Dublin during the civil war. Who Was Seamus Dwyer? – on the assassination of leading pro-Treaty politician, article by Michael McKenna. Evasive Manoeuvres: An Examination of Florence O’Donoghue’s Account of the Death of Michael Collins, by Daniel Murray. The Drumboe Martyrs – Kieran Glennon tells the story of his grandfather’s role in the execution of three republicans in Donegal in 1923. Thinking about Violence in the Irish Civil War, by John Dorney, an essay on the nature of civil war violence. 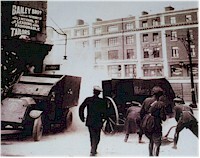 The Postal Strike of 1922 – a major industrial dispute at the height of the civil war, which the government put down by use of the National Army. The Big House and the Irish Revolution. How the republicans systematically destroyed the houses of the old Anglo-Irish landed class during the civil war. The Burning of the Big Houses Re-Visited, a follow up article on the burnings by John Dorney. Roundup at Midnight Mass, 1922, a story of the Catholic church and the republicans in Kerry in the civil war. Career (Mis)Adventurers, The IRB in the Free State Army, by Daniel Murray. The IRB among the anti-Treatyites, by Daniel Murray. 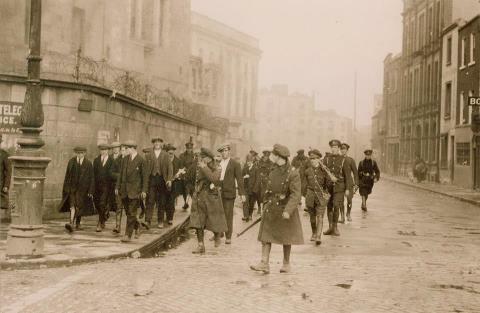 Policing Revolutionary Dublin 1919-1923, by John Dorney. Off to Fight for the Republic, the propaganda cartoons of Constance Markievizc, by Alison Martin. The Boys of the Old Brigade, The IRA Third Northern Division, by Kieran Glennon. Women and the Irish Revolution, by John Dorney. Casualties of the Civil War in Dublin– counting the dead and wounded. Mapping Civil War deaths in Dublin. Making Sense of the Irish Civil War – A conversation with Gavin Foster. Interview with John Dorney on ‘The Civil War in Dublin’ book, with Cathal Brennan. History Wars – John Regan discusses, among other things, the debates over the civil war among historians. Radio Discussion comparing the civil war and War of Independence in Dublin city. The Civil War in Dublin, with Cathal Brennan and John Dorney. John Borgonovo on the Civil War in Cork. The Irish Civil War – Divisive Memory, with Declan Power and Michael MacDonnacha. Article on John Dorney’s The Civil War in Dublin. The battle for Cork City, by John Borgonovo. The Fall of Dublin by Liz Gillis. The battle of Limerick City, and the Summer Campaign in Kerry, By Padraig Og O Ruairc and Tom Doyle respectively. Sligo: The Irish Revolution 1912-1923 by Michael Farry. From Pogrom to Civil War by Kieran Glennon. The Flame and the Candle, War in Mayo by Dominic Price. Judging W.T. Cosgrave, by Michael Laffan. The Irish Civil War and Society, by Gavin Foster. Emmet Dalton, by Sean Boyne. Everyday Violence in the Irish Civil War, by Gemma Clark. Report on the Irish Civil War Conference in Drogheda, September 2012. By Cathal Brennan. Report on Military Archives talk, ‘Establishing the Free State in conflict‘ includes estimates of the war’s death toll. ‘Up Us!’ The Launch of the Kilmainham Graffiti website. Written by: John_Dorney on 2 July, 2012.on 11 January, 2019. 2 Responses to "The Irish Story Archive on the Irish Civil war"